Our studio is available to rent for birthday parties on select weekdays, Saturdays and Sundays. 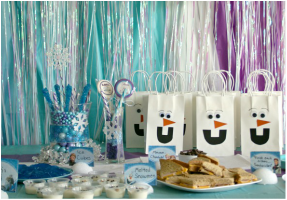 We're excited to offer new themed birthday parties which include our decorations and set up and fun add-on options. 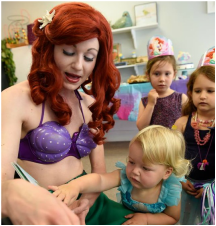 We want to make your child's birthday enjoyable for you too, so we're happy to help coordinate entertainment, pizza delivery, or cake pick up (within Marblehead/Swampscott/Salem) for a small additional fee. We can accommodate 12-15 children depending on age and number of adults. A non-refundable $50 fee is due at the time of booking. = $150 or $125 for children enrolled in a class. Leave it all to us! You pick a theme and we'll decorate using our decorations (of your choice), set up an activity, even coordinate with the entertainment! All you bring is the food and cake. Want us to pick up pizza and/or the cake? We're happy to for a small additional fee. *Includes decorations, set up/clean up, and one activity. Additional activities may be added on. Theme Parties start at $250. Cows & Pigs in the "hay"
Party Princess Productions - a visit from your favorite princess(es)! We're adding more party ideas all the time. Let us know what you want and we can see what we can do!